In this post we’ll go through all the options in the products section under WooCommerce Settings. First, click on WooCommerce in your sidebar and click Settings. Select the Products Tab. The first option we have here is to set the shop page. This is where all your products are displayed. If you have gone through the setup wizard, the dropdown will display a shop page for you to select. If you’re going through the settings for the first time, you won’t have the default WooCommerce pages, so the dropdown will look like this. 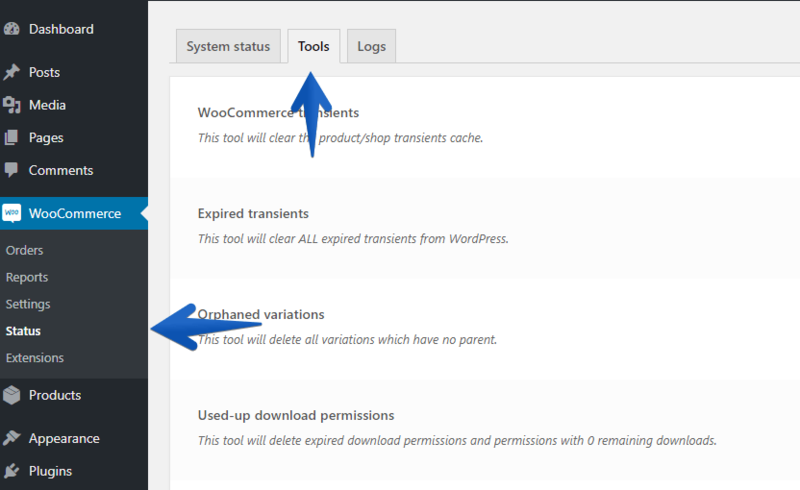 We can simply create all of the WooCommerce default pages by clicking Status (under WooCommerce in the sidebar), and then selecting the Tools tab. Scroll down until you see the option that says Create default WooCommerce Pages and click Create Pages. My Account page – the page where customers can log in and see their orders and personal details. Now if you go back under WooCommerce in the sidebar to Settings, and Products, you will see there’s the option to select Shop as the Shop Page. You will also see the other default pages we just created. The shop page is your product catalog. Here, you can select to either redirect customers to the cart each time they add a new product. Or enable AJAX add to cart buttons on archives. This means customers who add products to cart on your shop page will remain on your shop page without having to wait for the page to refresh. You can select the units of measurement you want your products to be displayed in. That one’s pretty simple. This section relates to reviews customers can leave on your products. Reviews are an important part of an online store – they have a huge impact on other potential customers! Enable product reviews – lets customers leave reviews on products. Show “verified owner” label on customer reviews – WooCommerce will check if an order has been made by the email address of the person writing the review. If they have made an order, their review will have a “verified owner” label. This shows potential customers that it is a legitimate review. Reviews can only be left by “verified owners” – Customers will only be able to leave a review using the same email address that they used to purchase your product. Next, you can set your product ratings options. You can enable star ratings on reviews – this allows customers to give your products a ranking. You can also select if you want to make star ratings required, rather than being optional. It might be better not to force people into giving a rating, especially those who might not have purchased your product, but just want to leave a comment. But that’s personal preference. Always make sure you click Save Changes before moving to the next section! This is the next tab along under the product settings. It seems like the latest update got rid of the display tab. Let us know if it comes back. Here, you can choose to enable stock management. This setting will allow WooCommerce to keep count of the physical products in your inventory. When you make sales, WooCommerce will automatically detract the items from your total stock. This setting is only really relevant for physical products. If you’re selling both physical and digital products, you can enable stock management on the individual products themselves. The next option is Hold stock (minutes). This is where you can put in a time limit for stock to be held on unpaid orders. So basically, if a person has an item in their cart, WooCommerce will take that item away from the inventory until the time is up. This is to avoid people double-ups on product sales. The downside to this is that your product may not be available for another potential paying customer if someone is holding the last item in your inventory in their cart. The time you select for this option should ideally be the average time you think someone might spend browsing your site before completing the checkout process. If you leave this section blank, customers will have unlimited time to hold products in their cart. 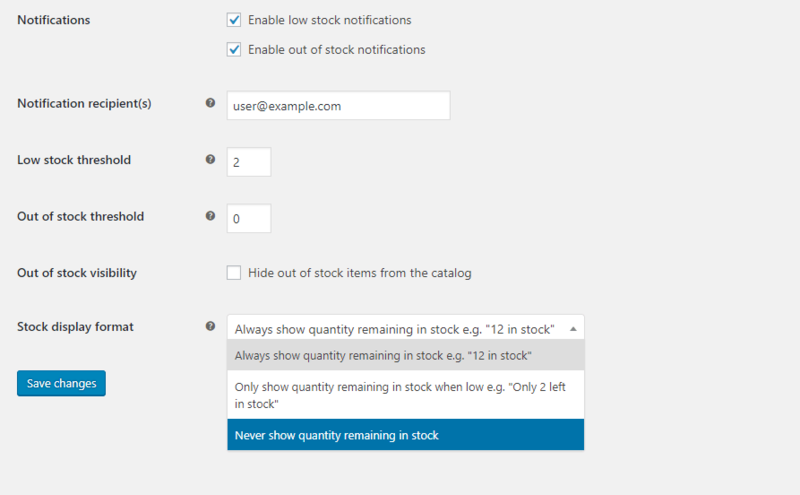 Next is the option to enable low stock notifications and enable out of stock notifications. These are for you, the store owner, so you can keep track on your available products. You can also set your low stock threshold – this is the point at which you deem your products to be low in stock. You can also set your out of stock threshold – this is the point at which you define your products to be out of stock (generally 0). You can also choose whether to hide products from the catalog when they are out of stock by selecting out of stock visibility. Then you can choose whether the customers can see how many items you have left in stock for each product. You can decide to only show stock numbers when they hit the low stock threshold (hit them with the fear of missing out factor), or you can choose to never show your customers how much stock you have. Click the last tab to access the downloadable products settings. 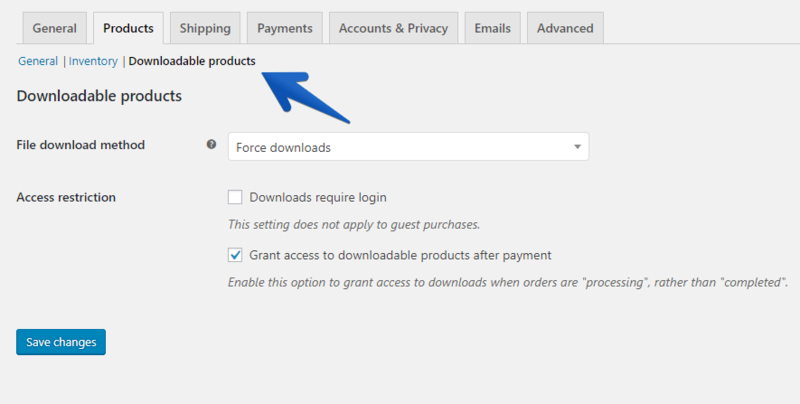 Force downloads is a secure way of downloading because it won’t give people a direct link to the file. Your file will download in the customer’s browser using a protected link. X-Accel-Redirect/X-Sendfile is the most reliable and secure method that’s handled by the server. You’ll have to install a module to use this option, so only use it if you know it’s available on your server. Redirect only is an unsecured way of downloading where customers are transferred to a page with a link to the file. Customers could share this link with all their friends, or all of Reddit if they wanted to, so you might not want to choose this option. Downloads require login – this means customers will have to create an account on your site and log in to download your product. This won’t apply to guest purchases, so if you want to force everyone to log in, then you’ll have to disable guest purchases also. Grant access to downloadable products after payment – Ticking this option means that customers are given your download straight away after they pay, whether you have received and verified the payment or not. It’s probably better leave this option unticked so that customers only receive their download after their payment has been verified.